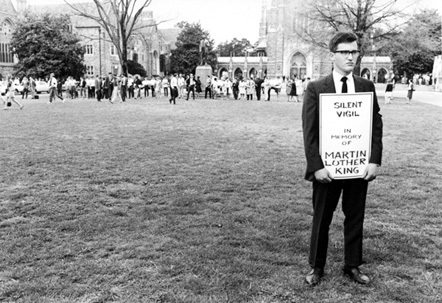 Although Duke University had been integrated for several years, disparity between the races still existed on campus. In the wake of the Martin Luther King assassination, Duke students drew up a list of demands for the University administration and marched to the house of President Douglas M. Knight. They demanded to see Knight, were admitted, and stayed for two days, unwilling to leave until their grievances were satisfied. Among their demands were that Knight relinquish his membership in the segregated Hope Valley Country Club and that he endorse an advertisement in the Durham Morning Herald in support of a day of mourning for Martin Luther King, Jr. What truly fueled the protest, however, was wages for the school’s underpaid, mostly black maintenance staff. The students demanded that a minimum wage be set (Duke University, like other nonprofits, was exempt from federal minimum wage laws) and that Knight appoint a committee to decide on collective bargaining and union representation for these workers. After the two days occupying Knight’s house, the students moved to campus, where at times as many as 1,500 protesters joined in a silent vigil, pictured here. Support began to pour in from around the country, even as local papers ignored the vigil as long as possible. Nelson Rockefeller, activist poet John Beecher, Duke professor and friend of Martin Luther King, Jr., Samuel Cook, and author and Duke alumnus William Styron all pledged their support. Presidential nominee Robert Kennedy telegraphed, “By your actions in support of employees who seek recognition for their bargaining rights, you set a standard that all should emulate.” In May, maintenance staff went on strike, a rare example of an alliance that transcended racial and socioeconomic divides. Regardless, the protest did achieve some of its goals. The university’s trustees agreed to a pay raise for the workers, and while it did not guarantee collective bargaining rights, the university did agree to review “the adequacy of the relationship between the university and its nonacademic employees.” President Knight, citing exhaustion and other health-related problems, left campus and was forced to resign a year later. While the students’ demands were not completely satisfied, their actions and the university’s concessions signaled a turning point in the university’s history.